In 2004, the US Marine Corps was looking for a quick solution to protect their troops in the field from improvised explosive devices (IEDs) that were devastating Humvees and similar utility vehicles in Iraq. Force Protection Inc. responded with a new vehicle that leveraged their experience with similar vehicles for South Africa and Rhodesia. The initial 27 vehicles were ready within six months of contract award and under the expanded multi-service MRAP program, the US military received another 4,000 examples. The British Army has also adopted this vehicle as the as the Ridgeback PPV (Protected Patrol Vehicle). 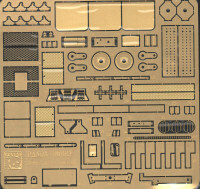 The decals provide markings and stenciling for a US Marine Corps example. There are many good photos online of the Cougar and its larger 6x6 brother. 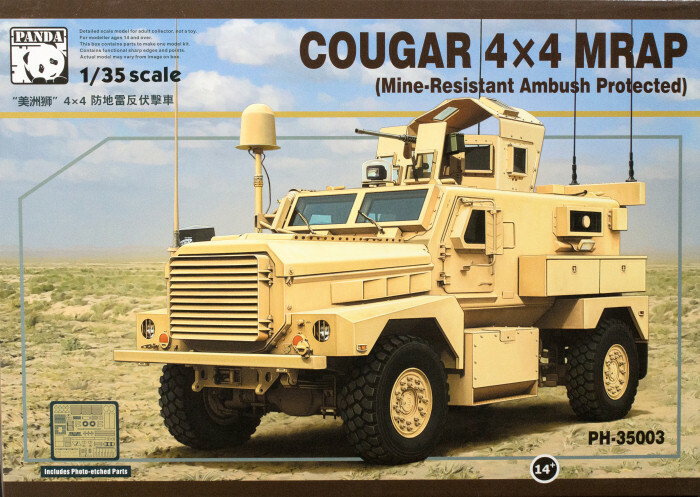 This is another great-looking kit from Panda Hobby and it is gratifying to see another member of the MRAP family is finally available in scale. Keep them coming! My sincere thanks to Panda-Hobby for the review sample.